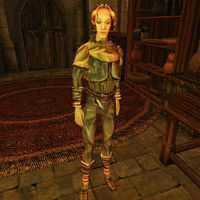 Syloria Siruliulus is an Imperial trader and Adept of the Imperial Cult at Buckmoth Legion Fort. She is wearing a common shirt with matching pants, shoes and amulet. Aside from her natural charm and ability to absorb fatigue from others, Syloria knows the following spells: Divine Intervention, Mark, Recall, Detect Creature, and Detect Key. Because of how combat AI works in Morrowind, Syloria won't use any of the spells above that she knows.